We're excited to share the Power BI Mobile update for June because it's packed with really great improvements and a number of exciting new features! Don’t have the app yet? Visit our site or download it from your favorite app store. Mobile BI is not only having your data always with you, but also about leveraging your device's capabilities, such as the camera and geographic location services, to give you the knowledge you need quickly. With this release we are happy to introduce several new functions that make the most of your device. We will dive deep into each of these capabilities in the future! You can now center any map tile on your dashboard to your current location. When a map tile is in focus mode, you can zoom into your current location to see only points that are near you. But wait, there's more! We've also added geo-filtering capabilities that let you filter reports with geographical data by your current location in just one tap. When viewing reports with data about the city, state, or country that you’re in, you’ll be able to filter your data by that city, state, or country. As long you’re using the app, the filter will remain in effect in the reports to which it was applied. Learn more about setting and using Geo filtering. With Power BI Mobile, QR codes become the link between anything in the real world and related BI information, with no navigation or search needed. In June's release we take this experience one step further, transforming QR for tiles into Augmented Reality mode on iOS. Now when you scan a QR code that was generated using the Power BI service, the tile will render in AR mode. With AR, you can stay in the context of the real world, and get your data in a virtual overlay. Tap the image to enter interactive mode for the tile and navigate to its parent dashboard. Learn more about data in the real world. A barcode is an optical machine-readable representation of data relating to the object to which it is attached. Barcodes are broadly used in the retail industry to mark products by the manufacturer, often representing the product unique identification number. With the Power BI scanner for iOS, you can now scan barcodes printed on products or shelves at your store. This will display related reports filtered by the scanned value. Stay tuned for a Barcode deep dive blog post. Learn more about optimizing your reports for barcode filtering and using the Power BI app to scan and filter reports. We recently launched the Power BI notification center for the Power BI service, which collects all of your alerts in one place. 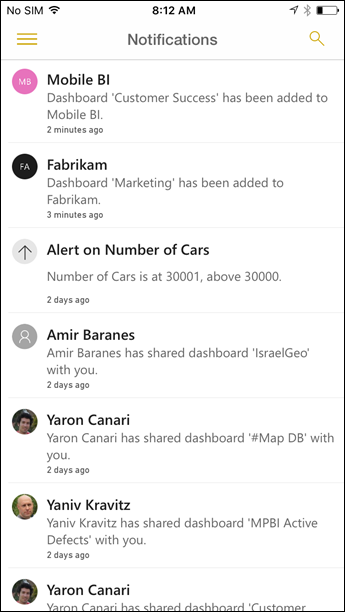 The notification center has also now debuted in the most recent version of our apps for Android and Windows 10 Mobile, and we've improved the notification center for iOS by including all possible alerts, from data details to shared dashboard notifications. Never miss an important update again! Learn more about Power BI notification center. You can now quickly access your favorite dashboards from your mobile device, as you do with a desktop or laptop computer. Simply go into the new Favorites tab in the main navigation and select the dashboard you wish to access. To add a dashboard to your favorite list, open the desired dashboard on your browser and click the Star icon in the top right corner. We are very excited about SQL Server GA! We've made some improvements across all apps to make data refresh more efficiently to reduce the load on your device. On the Power BI Mobile app for Windows 10 we added the ability to drill through from a KPI to mobile report, or to any custom URL. Meanwhile, the Android app includes several bug fixes, including fixing the currency symbol for SQL Server Reporting Services KPIs. Slicers are a great way to explore and focus your data, and become even handier when exploring data on a relatively small screen like your mobile device. In this release we have resolved some bugs reported by you, and also applied selection control to mobile reports. You can control the selection mode of the slicer when editing on Power BI Desktop, and this will automatically impact the way slicers work on mobile. Choose between Single selection to allow one slicer at a time, or select Select All to allow the selection of multiple slicer values. Whatever you define on your report will also be applied to mobile devices. Learn more about Slicers in Power BI. With this release you can also find bug fixes and improvements. The Windows app contains several fixes that significantly improves its performance and stability. On The Android app, we fixed accessing dashboards that are shared with you via email invitation. That’s all for this update! We hope that you enjoy these new and improved mobile features, and continue sending us valuable feedback about our product. Please don’t forget to vote for other features that you would like to see included in Power BI Mobile in the future.